Do you remember this song from 1968-1969? I am dee Frito Bandito. I love dem I do. I take dem from you. By 1970, this jolly, little bandit had kicked up quite a fuss in the Latino community, similar to the protests about sterotypes generated by Taco Bell's talking-dog campaign. The Frito Bandito spoke broken English and made his living robbing people for their corn chips. The Wanted Poster premium describes him as cunning, clever and sneaky. Backhanded compliments? Maybe, but the Frito Bandito campaign was discontinued and replaced by the Muncha Bunch. 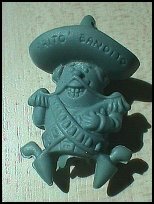 The controversy plus the age of the Frito Bandito, makes anything with his likeness quite collectible today. As part of the ill-fated campaign, kids could get Frito Bandito premiums whenever they bought corn chips. I especially remember getting the popular pencil eraser (also know as a pencil topper) in a box of single serving sized packages. This little fella was made of (red, yellow, blue, green and gold) rubber and would fit right on top of your pencil, doubling as an eraser, and a nice distraction for those late summer school days that just never seemed to end. This gun-toting junk-food bandit, in good condition, can bring up to $20 today. Remember, he was an eraser, so finding one in mint condition is tough. You can also ask any vintage doll collector about kids and their need to chew in their formative years. Button - "I'm A Frito Bandito"